Here we have a new Fender Squier Affinity Series Stratocaster with a Maple Fingerboard in 2-Color Sunburst. 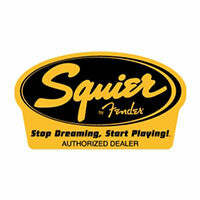 This guitar does not come with a case, however we have several suitable options for the Fender Squier Affinity Strat. Affinity Series guitars represent the best value in solid-body electric guitar design. Dressed in eye-popping finishes, the Affinity Series Stratocaster features a bolt-on maple neck with a maple fingerboard and three single coil pickups. If you have any questions, give us a call or stop by to check out and save on a new Fender Squier Affinity Stratocaster at Ken Stanton Music today.